This classic shortcake recipe is to die for. Hope you enjoy the homemade buscuits as much as I did! Heat the oven to 400 degrees. Sift together the flour, sugar, baking powder and salt into a large mixing bowl. Cut in the margarine with a pastry cutter. Or use a vegetable grater to grate the stick into the mixing bowl and let your kids take turns blending the margarine into the dry ingredients with their fingertips. Once the dough is crumbly, slowly stir in the milk. Turn out the dough onto a floured working surface and gently roll or pat the dough into a 1-inch-thick rectangle (it should measure about 6 x 8 inches). For the best results, handle the dough as little as possible. Slice the rectangle into four 1-1/2- x 8-inch strips. Place the strips on an ungreased baking sheet, then let your child mold and curve them into S shapes that resemble snakes. Bake for 10 to 12 minutes until the bottoms are golden brown. Transfer the baked shortcakes to a wire rack (a parent's job) and let cool. 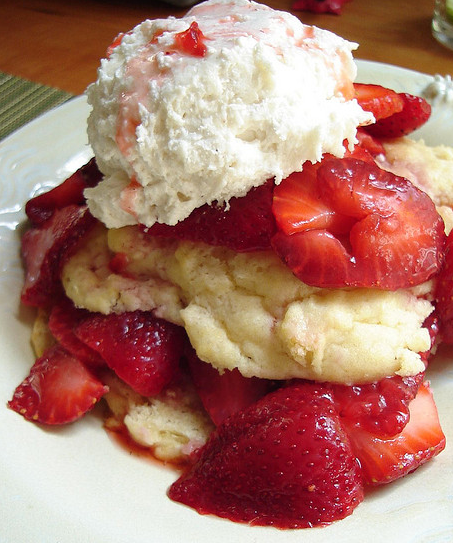 Carefully slice the cooled shortcakes in half lengthwise or split them with a fork and then set aside. Wash the strawberries and let your kids select four to use for the snakes' heads. Slice the rest of the berries lengthwise into a mixing bowl. Toss with the confectioners' sugar and let stand while you prepare the whipped cream. Combine the whipping cream and confectioners' sugar in a chilled bowl and beat with an electric or hand mixer until stiff peaks form.